Love this outfit and the color is amazing on you! I'm so loving this latest pearl trend! 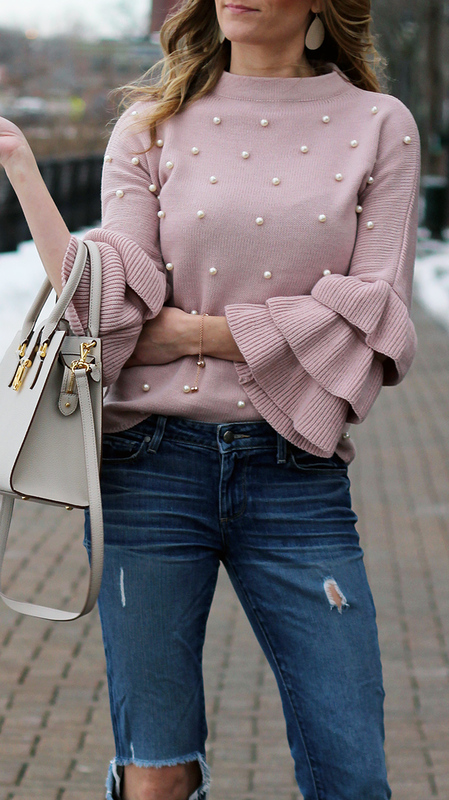 I have a post next week talking about the same thing :) Love the ruffle detail on the sweater too! Such a fun fashion find! I've been seeing this sweater everywhere! It's so pretty! 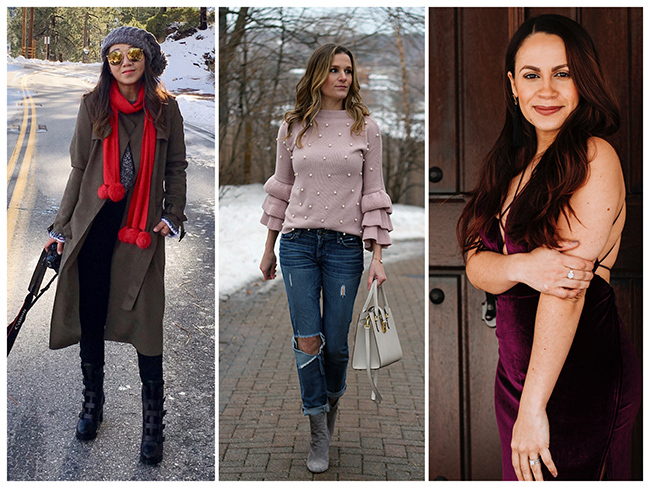 I am such a sucker for all things blush and embellished recently! Beautiful look! Love this pink sweater! It is so pretty on you! Such a chic and romantic sweater! I have a similar style with pearl-embellished bell sleeves. I'll have to pair it with distressed jeans and gray booties for a more casual styling! Really into this embellished trend! This is the perfect sweater to take you into Spring! Well you know I love this sweater! So cute with regular denim as opposed to white how I styled it. I guess that great minds think alike, because I am wearing grey booties with denim today, also !!! Love your style. I love the embellishment with pearls, it's such a beautiful look! I love how you styled it. I have that sweater and love it! I need to try it with distressed jeans like you did! You've got two of my favorite things going on here: pearls and ruffles. So obviously I need that sweater in my life ASAP hehe. Such a pretty sweater, I love the pearls! This sweater is giving me all sorts of heart eyes! I am ready to try this embellished trend! I am loving how you combined two trends, ruffles and pearls! I really may need to get this top... I think I may have seen it on a couple of other bloggers (or something similar), too. But, every time I see it I just love it! The pearls and the sleeves, so pretty! 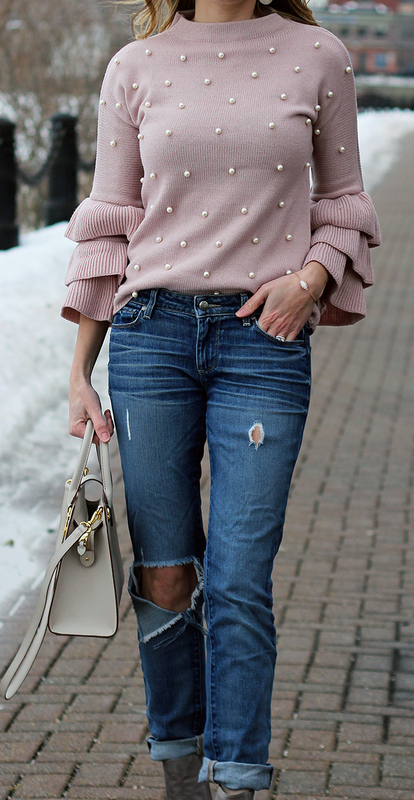 The pink ruffle sweater is so gorgeous! I love it! I love this sweater! What a pretty look! I am in love with the detail in this sweater and that color is perfection. You look way too cute. I was legit just looking at this sweater on shein the other day and wondering if it was cute in real life! I love it! I love the details on this sweater, so pretty! Loving pearl details on sweaters & jacket lately! You look so cute! Pearls and ruffles are two of my favorite trends!! I love this classic look with the unique sleeves and pearl detail. Beautiful! Lovely sweater you got there dear. cute color, love the ruffles too. Pearls really make sweaters look extra chic and classy. Oh the pearls are so cute! I am definitely NOT sick of your gray booties! And this top is so perfect! The pearl detailing is so cute!!! Love the colour as well. In love with this look!! Such a nice outfit, I love how this is styled! The sweater is adorable!! I love all the pearls. I love the pearl details on this sweater. It adds to the sweetness of the ruffles and the blush color. And thank you so much for the feature! It made my week! oh my goodness I need that sweater now! so darling and cute! ok - way too cute ! I'm loving your whole outfit especially the sweater ! 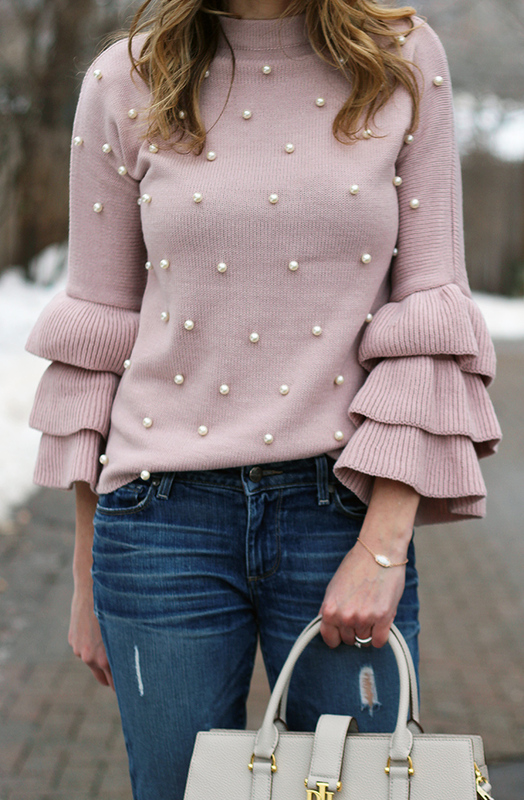 I am loving the pearl trend and that sweater is beyond adorable! I just love the sleeves on this cutie! The color is really pretty too! I absolutely love the sweater the pearls and ruffles are so feminine!